For small RC paraplanes such as the skysurfer and it's clones - foam and plastic film canopies seem to outperform cloth ones by quite a margin. Currently plastic canopies can't be bought except as part of a complete skysurfer clone. These only come in one size and are poorly made. Wider genuine skysurfer canopies were once available but currently they are withdrawn from international sales (I don't know if they are still available in Japan). Above - my modified sky surfer clone in flight with the stock canopy. I have two clone chutes and both a regular and wide genuine skysurfer chute. The wide chute is a regular one with four extra cells stuck on (literally). These chutes have soft foam ribs - 19 of them on the standard chute to form 18 cells. They have many lightening holes. Presumably they are die cut. The plastic skin appears to the welded onto the foam. The chutes also have a spreader or stiffener at the front. This is a thin plastic tube with joiners and end-caps. The black end-caps are visible in the large version of the above image. It is the back dot "on" the outer rib near the leading edge. I've done some experiments and making a plastic chute at home looks practical. The original canopies appear to be made from HDPE. It is possible they are something else (like a coated mylar). I originally thought they were mylar but pure uncoated mylar doesn't weld well. I haven't found a source of film in the color, size and thickness I'm after. Clearly thousands of tonnes of this stuff are made but finding small quantities locally isn't easy. Nobody bothers to mark what type of plastic is used. The closest thing I've found is plastic protection sheets (drop sheets) made by "Sirdar". I could only buy blue in this style - they also have clear ones but they don't look like HDPE. They come in two grades. When I weighed them they seem to be 40 grams/sqr meter for the lighter one and about 55 gsm for the heavier one. This seems about right for matching the original chute. The sheets don't seem as strong as the original chute material but I'm not prepared to destroy my chutes to find out. I also bought some clear builders plastic. This is 100 gsm - it is heavy but not out of the question. I'm not sure if this is DHPE but it feels very strong. All this is so cheap it isn't even worth mentioning. Maybe a dollar (or two) to skin a .6 sqr mtr chute. These appear to be the same sort of foam used for high density foam (PU) camping or yoga mats. They are about four mm thick. Most mats are thicker. I bought one which is about six mm. I have some scraps from an old one which are about four mm so they have been available in the past and someone may still sell them locally. I think six mm would work as long as the foam density is about right. If weight is a problem the holes could probably be enlarged a bit. A 450mm rib made out of this foam for my test "kite" weighs three grams. This is without any holes cut in it. These ribs are little bigger than the surfer's ribs. With holes I might be looking at 45 grams for a set of 19. This will quite a bit heaver than the stock chute but still lighter than most cloth ones. I hit upon the idea of placing teflon tape over the area to be welded and peeling it off afterwards. This turned out to work very well. I used pieces of shopping bag and fused it fused to camping mat material. I just used my soldering iron as a heat source. The shape of the iron was not ideal but proved the concept. I also tried waxed paper instead of teflon - it worked. However the best thing has turned out the be sailcloth. It bought a length of 2 oz spinnaker cloth for making a chute but didn't expect to be using it like this. Polypropylene peel ply (from a fibreglass supplier) also works but sailcloth is my favorite. I'm sure there are lots of alternatives. I used a good temperature controlled soldering iron initially. I've also found the tip of a hotmelt glue gun (without the glue) works if you're patient. My current hot tool is a big, cheap 80W soldering iron with some mods. I bought a spare tip and ground it to be slightly curved. This iron was way way too hot so I've put a light dimmer in series to give some control over the tip temperature. If I was doing a lot of this stuff (I won't be) I'd go back to using a good small variable temperature soldering iron with a customized tip. It might be possible to put a non-stick coating on it and not use the peel layer on top. I'm not going to bother. Here a piece of heavy duty drop sheet has been welded to the edge of a piece of foam. I've partly peeled off the sail cloth. 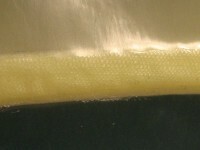 If you click on the thumbnail and view the larger image you can see the weave pattern which has been impressed into the plastic sheet. On the far left you can also see the color change whether the blue plastic has fused onto the cloth. This color change is a good visual clue to the state of the weld. Unfortunately this doesn't work with clear plastic. A closeup of the clear piece of builders plastic fused the edge of a piece of foam. Next I made a little test parafoil. Created by System Administrator. Last Modification: Saturday 14 of July, 2007 10:43:11 AEST by System Administrator.